The Bowen Sequences & successfully perform the Bowen Sequences. How to release symptoms from injuries, health conditions and stress- related pain. Knowledge of 17 Bowen Technique Sequences. Knowledge of Health Conditions Bowen Sequences Benefit. Techniques that can produce Healing of Muscle structure or Pain. Over the three (3) day period, the Bowen sequences are presented in a hands-on atmosphere where student participation is encouraged. Emphasis is placed on reading the body, and learning how Bowen’s philosophy is individualized to each client. Students receive a workbook. A twenty-two (22) hour merit diploma is awarded at the end of the class. This is a prerequisite for certification and Advanced Bowen Therapy Training classes. Be sure to request the Complete Health Fitness “preferred rate” (corporate discount) at the time the reservation is placed. Reservations may be made directly with the Homewood Suites by Hilton Atlanta Airport North, by calling (404) 554-9300. Hand towel to place head on when using massage table. No jeans, spandex or slippery material. Women please wear a sports bra. This information has not been evaluated by the Food and Drug Administration. This information is not intended to diagnose, treat, cure or prevent any disease. It is for reference and educational use only. 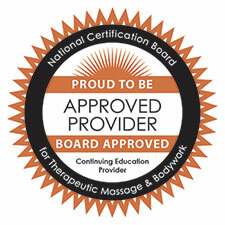 Approved by National Certification Board for Therapeutic Massage and Bodywork (NCBTMB) as a continuing education provider. Why Choose Complete Health Fitness? Completed Early Bird Discount application and/or Enrollment/Registration form (including payment in full) must be received (in our hands) by the timelines detailed below. NOTE: Early Bird Discount Application and Enrollment/Registration – closes 60 days prior to class start date. NOTE: Standard Enrollment/Registration – closes 45 days prior to class start date. NOTE: Late Enrollment/Registration – closes 30 days prior to class start date. NOTE: Enrollment/Registration less than 30 days in advance of class start date may be considered on a case-by-case basis, at an increased price. Would you like a class near you? Standard business procedure: Payment is received in advance of class. Once payment is received the class is secured. Monies received are non-transferrable, non-exchangeable, and non-refundable. If for any reason you are unable to attend the class, please call at least two weeks in advance. Failure to provide notice may result in forfeiture of all monies paid. Failure to appear for class may result in forfeiture of all monies paid.